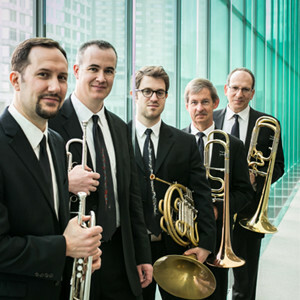 AMERICAN BRASS QUINTET 2018-2019 Highlights | Kirshbaum Associates Inc.
Last season, the Quintet’s U.S. tour brought them to 18 cities in 15 states, including New York, Portland, Savannah and Colorado Springs, among others. Their highly successful concert tour “Blows the Roof Off Bing” (San Francisco Classical Voice) in Stanford, CA and was praised by Broadway World as “rich, stylish, full-out glorious playing by all concerned”. This season, the American Brass Quintet appears at the Art Institute of Chicago, University of Idaho, Barrus Concert Hall and Mahaiwe Performing Arts Center, and in Stamford, NY, Norfolk, VA and Bryan, TX. In a special project presenting a multi-cultural exploration of chamber vocal literature and featuring music of Victoria, Guerrero, and other Spanish composers, the American Brass Quintet collaborates with the GRAMMY® nominated vocal ensemble, Seraphic Fire, and embarks on a U.S. tour in Los Angeles, La Jolla, Kansas City and Goshen, IN, and five cities in Florida including Miami, Boca Raton, Coral Gables, Ft. Lauderdale and Cutler Bay.